Anyone who needs to work with Microsoft Excel in order to connect to external data and then process, analyse and display the data in order to produce suitable output at all levels within an organization. Excel Power Users, executives, managers, data & business analysts, IT professionals and BI Consultants. This 1-day intermediate level Power Query training for Microsoft Excel 2013/2016 is suitable for partipants who are proficient users of Excel, familiar with PivotTables and understand the basics of Power Query Level One. The topics include importing data from Web, data restructuring, more advanced Power Query functions, understanding "M" code, and creating dynamic date table. Importing Data from Web Page and data feeds. Transforming poorly structured data into useful data. Use Power Query Functions & create customized functions. Exploring the M code and take your Power Query skills to advance levels & create dynamic query. Creating and implementing calendar tables. 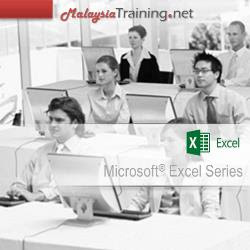 Delegates should be proficient users of Excel, familiar with PivotTables and understand the basics of Power Query Level One. This module explains to connect to website to import data from tables. Learn how to connect to OData feeds to get data. OData is a standard for providing access to data over the internet. In this module, you will reshape data complex data structures such as cross tab tables, tables with multiple headers. This module shows how to use more power query functions and multiple condition logic, build customized functions and use it for repeated transformation. In this module, you understand the logic of "M" code and how code is written. Complicated data transformation can be done using "M" language for Power Query. Learn how to access the HELP to Power Query functions. You will create a dynamic query using "M" code which makes the query flexible and allows others to use the query without having to modify it. Date table is important with Time Intelligence scenarios with Power Pivot. With a dynamic date table, you will not need to extend your calendar manually as time goes by. You will also create Fiscal calendars which is a little more complicated than a normal fiscal year that ends in December.